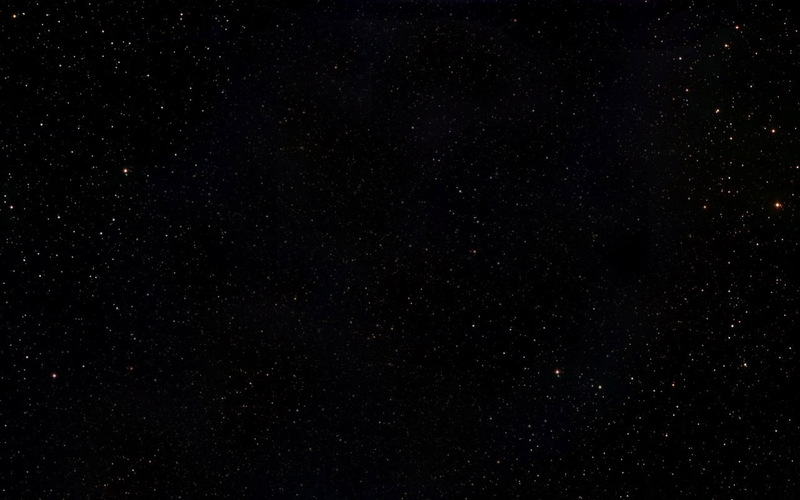 "Bull's eye in the sky, oh my!" 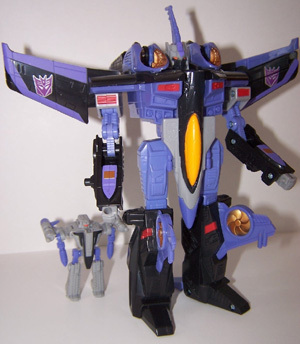 Bio: [From the Undercover Files of ~ Autobot] They say that the clouds get a little bit darker when Skywarp is in the air, and they're not too far off, There's a darkness around this Decepticon that's as intense as his grim attitude, Serious-minded and determined but with an ironic wit, he's the kind of 'bot I can respect and trust to do his job, the only problem is that he's on the wrong side of the Autobot/Decepticon fence, As much as I appreciate this quiet, professional Decepticon's abilities, I know that I can't let myself be fooled into thinking he's actually my, well, friend. That's the kind of mistake that an amateur makes, and I'm no newbie. 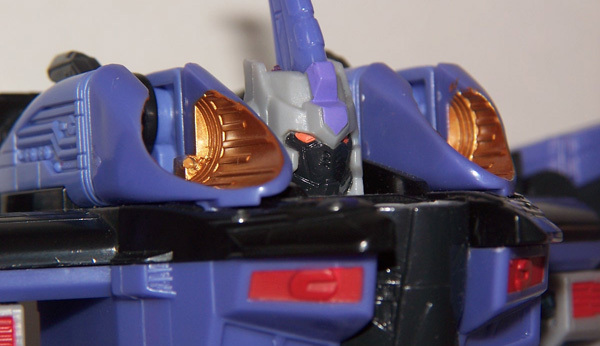 If Skywarp knew that I was working deep cover for the Autobots, would our friendship mean more than doing his duty? Or would he live up to the cold, remorseless reputation he's earned so far? 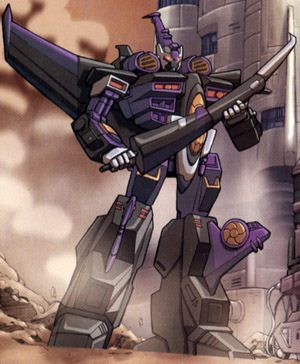 Maybe I've been here too long, but-of all the Decepticons I've worked with while undercover-Skywarp is the only one I don't want to face in battle.. .and it's not just because of his formidable skills. 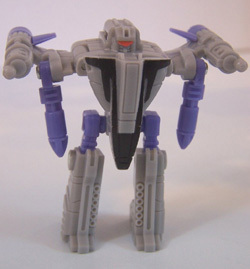 Weapons and Abilities: Strong, smart, and super-fast, he's easily a match for his prominent relative, Starscream. 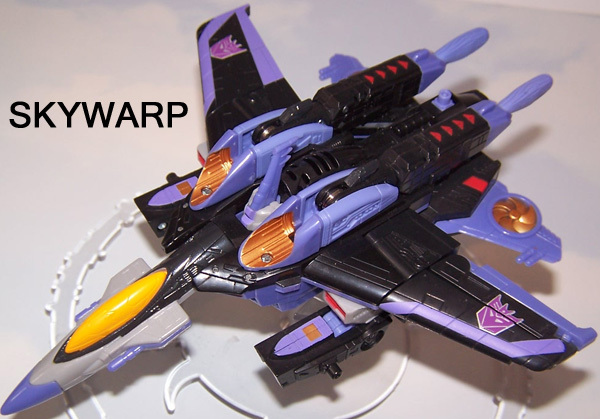 Unlike that questionable bit of robo-trash, Skywarp is a consummate professional. 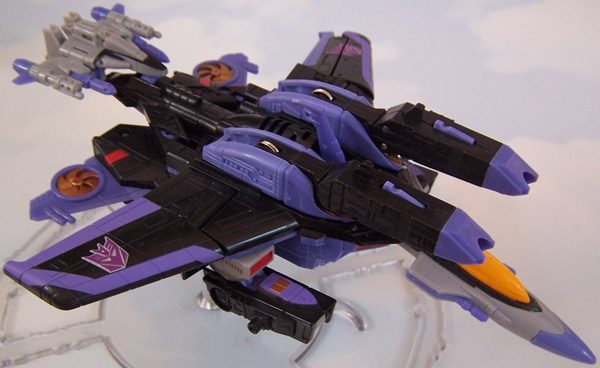 He's an incredible marksman in his jet mode, capable of targeting a meter-long target at a distance of 10 kilometers with no problems. This ability has gained him the nickname "Bull's-Eye in the Sky;' which has become his mocking catchphrase after slagging an opponent, He's equally intense about his abilities in robot mode, training hard in all types of martial arts until he's as precise, silent, and deadly as what the Earthlings call a "ninja:' His two missile launchers each fire a salvo of 10 mini-projectiles that Skywarp can aim with uncanny precision. 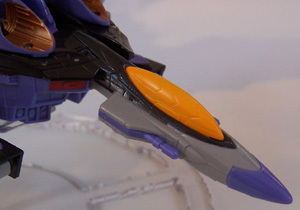 He also wields a diamond-hard blade in robot mode with fatal efficiency. 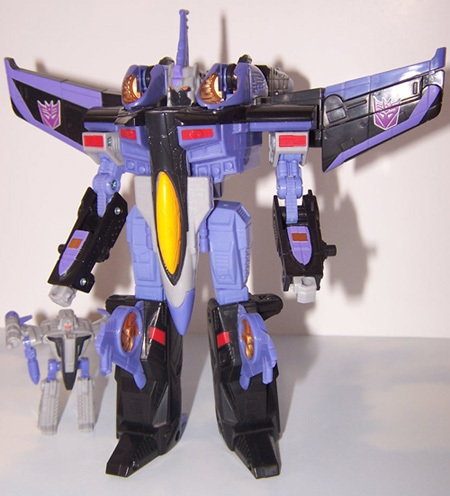 Weaknesses: Beneath his cool exterior, Skywarp is still sensitive to comments that he earned his position with the Decepticons solely by being related to Starscream, Maybe he trains so hard to dismiss those accusations once and for all. 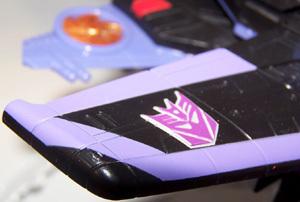 Regardless, comments about how he earned his position are the only thing that can always easily bait Skywarp. 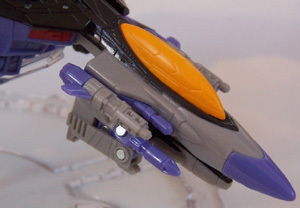 abother picture of Skywarp in jet mode. 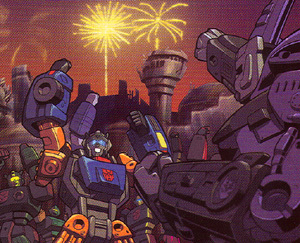 Thunderclash puts up with Skywarp's negative comments because of the benefits of being associated with the feared warrior. 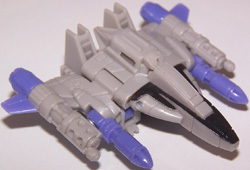 It is believed that Thunderclash started the rumors that Skywarp earned his position because of Starscream in order to have some potential blackmail to better control his Dcpt partner. 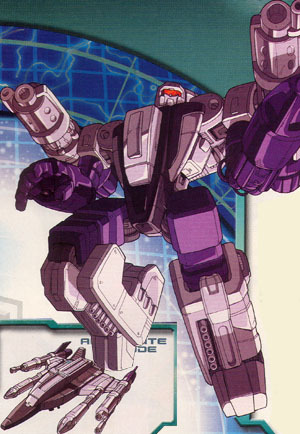 Weapons and Abilities: Subject is highly intelligent and possesses mid-level strength and endurance for a Mini-Con. 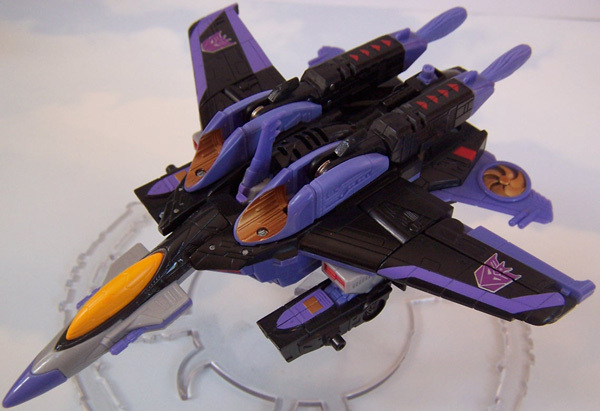 He is an adequate pilot in his jet mode, and his twin machine guns are a devastating weapon in both modes. Subject is an acceptable combatant, but his real skills lie in being able to manipulate almost anyone he comes in contact with. His greatest asset is the amazing reach of his social network. 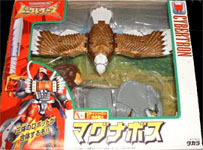 Weaknesses: Although he has many friendly contacts, Subject also has some resentful enemies. 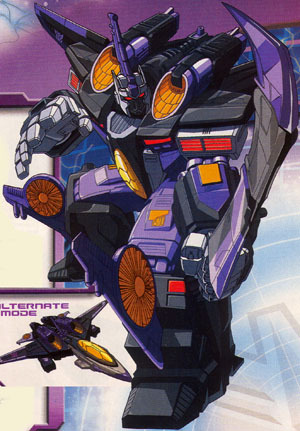 He is in constant danger of someone, like Skywarp, discovering his " " backstabbing and then taking vengeance against him.